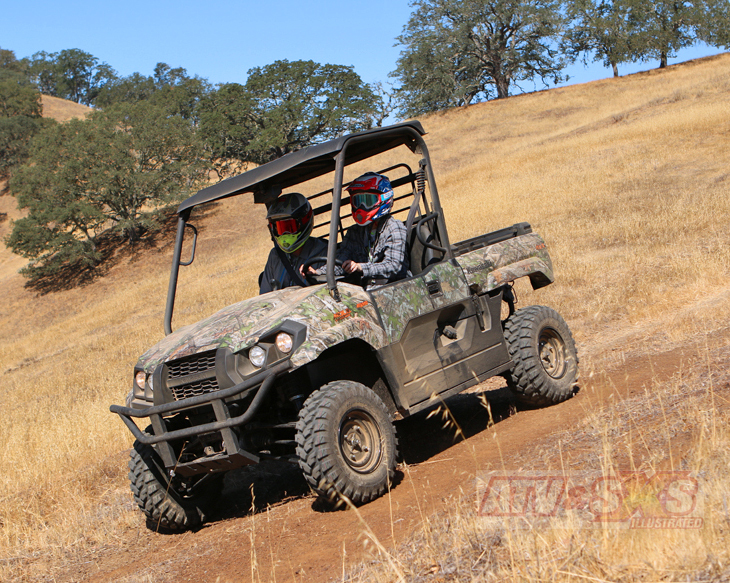 Kawasaki’s Mule Pro-FX has earned an enviable reputation as being extremely capable, well-equipped, and superbly reliable. We make no secret about what we think of the Mule Pro-FX; We LOVE it! It’s a big machine capable of handling anything we’ve asked of it, and it’s our first choice every time we’ve got a tough job to do. The only drawback for some is its size. A huge cargo box on top of a surefooted chassis means a long and wide footprint. That means the FX takes up a lot of trailer or garage space. Kawasaki realized not everyone needed or wanted the full-sized FX and the all-new Mule Pro-MX is designed to address that issue. Protected storage under front hood and seat. Numerous smaller storage areas as well. Comfort is a key factor in perceived performance. Nobody wants to fight a machine every time they’ve got a job to do. 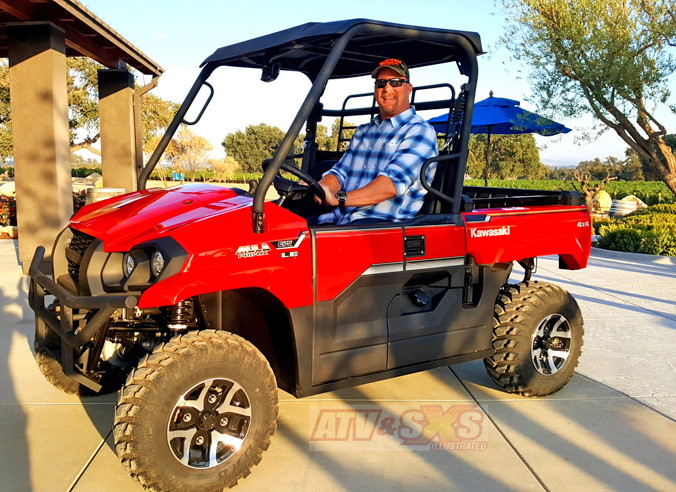 Kawasaki did an excellent job with the cab on the Mule Pro-MX and from either the driver or the passenger seat it has everything you need within easy reach. The steering wheel tilts for the driver, all the switches are centrally located, there is a very nice digital display in the center of the dash and we appreciate how it is angled slightly toward the driver. Storage includes a lockable dash glove box and there are a couple open cubby holes along with cup holders built into the dash. Down below, the pedal angles are good, and the floor has a diamond plate textured surface to keep muddy boots from slipping. Seating position is fairly upright with a comfy back rest, but we especially appreciate the sculpted seat base which helps hold you in place. This is a feature we’ve asked for and Kawasaki would do well to include on the full-sized FX model. Just like with the FX, the Mule Pro-MX gets half doors for side protection and we really like them. The Mule Pro doors always close and latch securely, they don’t rattle on the trail, and they provide a nice separation between you and anything along the trail whether it’s mud, splashing water, or brush. 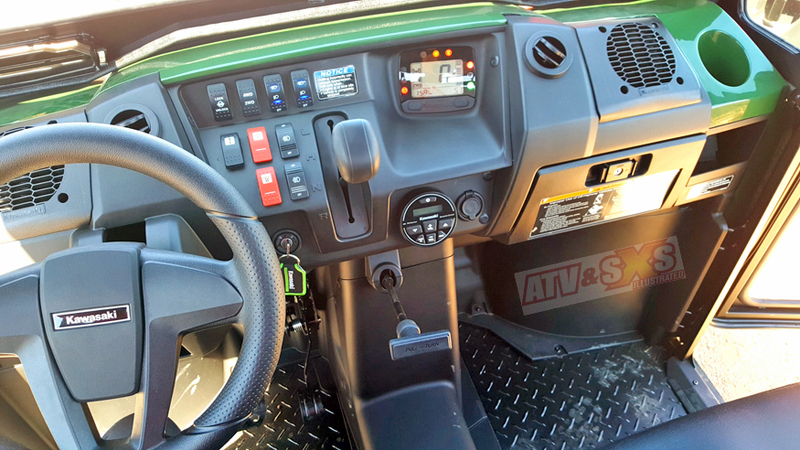 From the comfy steering wheel to the seats we really like the Mule Pro-MX cab. Storage is very important on a Side x Side. 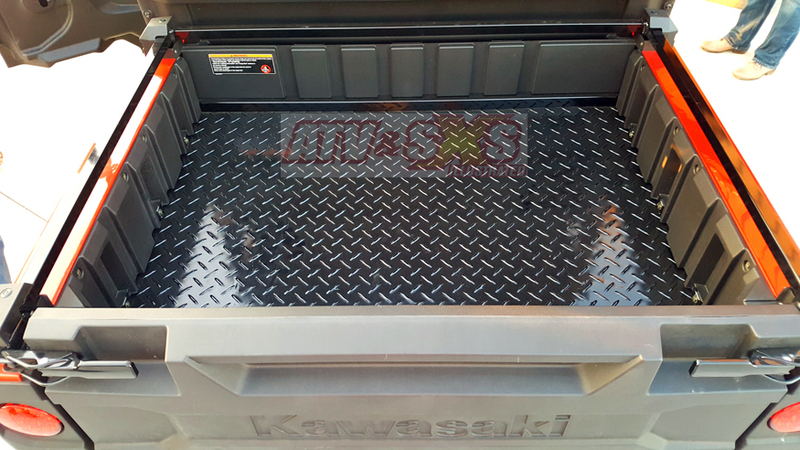 Kawasaki gave the MX a good-sized compartment under the front hood and a secondary storage bin under the passenger seat. Neither are completely waterproof, but we consider them to be well protected. 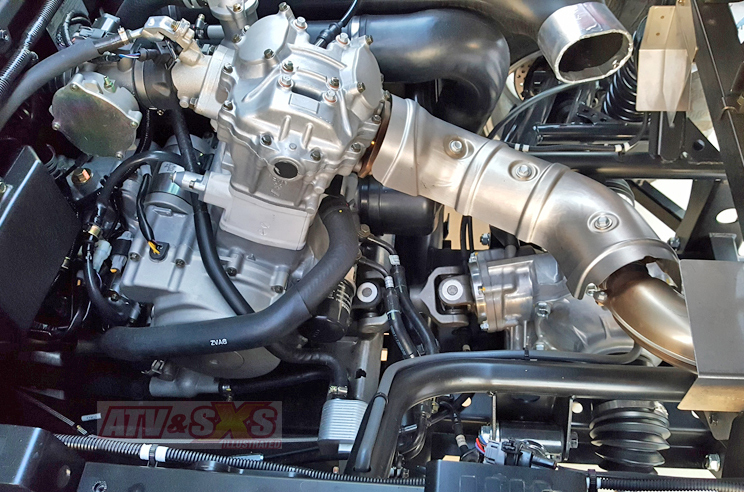 With a 700cc class motor the Mule Pro-MX can hardly be described as a mid-sized machine, but that’s got more to do with the chassis specs than engine displacement. 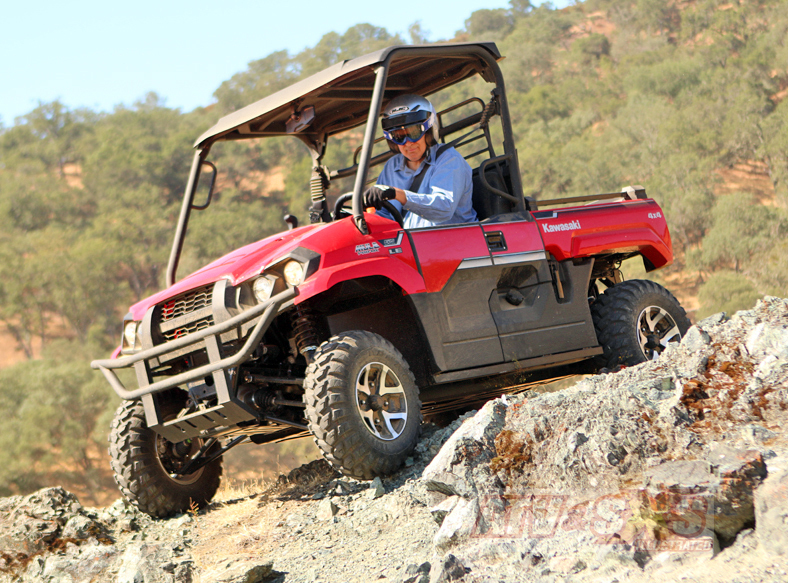 The Mule Pro-MX is powered by a fuel-injected 695cc SOHC, 4-valve, four-stroke engine tuned for a broad torque curve. Remember, the MX is still a Mule and that means towing a heavy load at times. Mated to the engine is Kawasaki’s CVT transmission. All you need to do is select either forward (Hi or Low) or reverse. If you need a little extra traction, a button on the dash engages the 4WD system which has a dual-mode, locking rear differential. The entire CVT system was designed for heavy hauling, but it also aids in engine braking, making slowing a heavy load or descents down steep slopes safer. Our top speed runs had us just over 45 mph which surprised us because that is identical to the top speed of the full-sized FX model as well. Everything about the engine and transmission (and really the entire machine) was built for durability, from the plating to the UV coating on the plastic. One feature we always seek out with any new machine is the maintenance items. Machines that are difficult to service often get ignored. There is no reason to skip any required service on the MX. 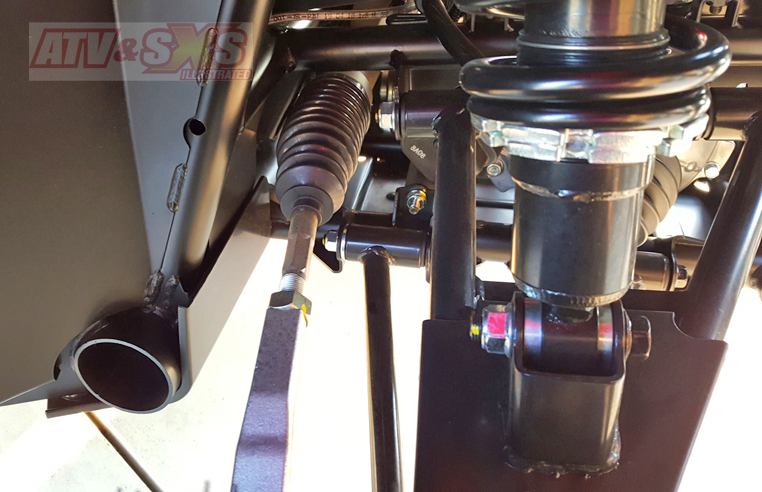 The oil filter is super easy to reach on the driver’s side of the engine, and under the seat is the battery, oil dip stick, and the airbox. Both the airbox lid and the large diameter, pleated filter can be quickly removed with no tools. 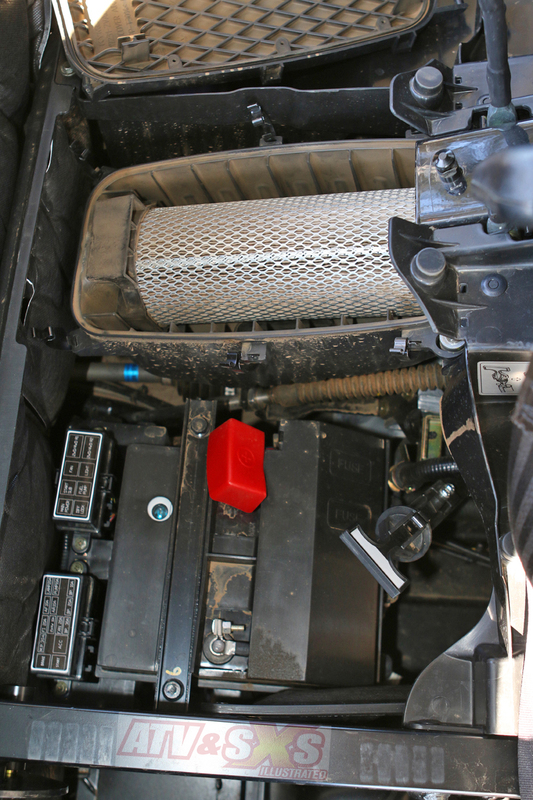 The engine air intake and the CVT air intake were located high in the chassis to avoid sucking in water, dust, or anything else that you might find on the trail. Underneath the front hood is the brake master cylinder and the radiator coolant reservoir. The electronics were not forgotten and they too get extra protection by enclosing them in a bay high in the chassis. We like the styling of the Mule Pro-MX bodywork! It presents a bold, tough look in a mid-sized package. Body panels fit tightly and the plastic is pliable enough to take plenty of abuse, and tough enough to resist scratches. Like every Mule, the MX is all about taking on tough jobs and that means it gets a heavy-duty cargo box at the rear. We really like how dividers are formed into the bed walls and you can insert boards between, creating individual spaces. The bottom of the bed is diamond plate steel for durability and the bed pivots high enough for easy unloading. We also love the tailgate latches which automatically find their attachment point. Two LED tail lights are built into the box corners. 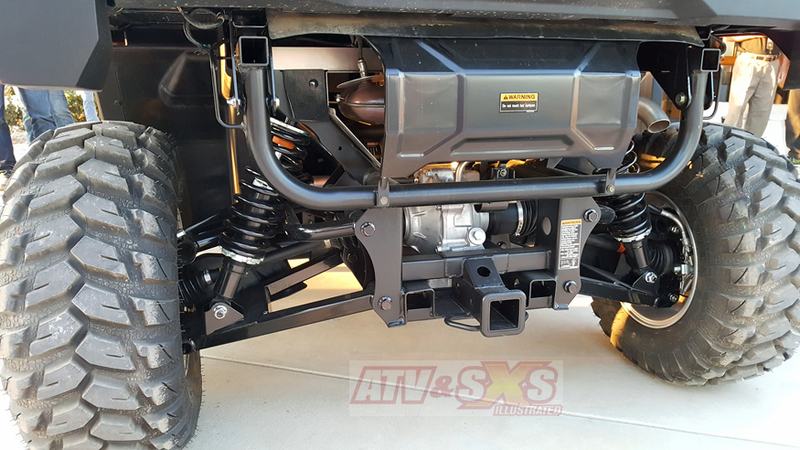 Underneath the bodywork the Mule Pro-MX gets a tough, ladder style chassis. 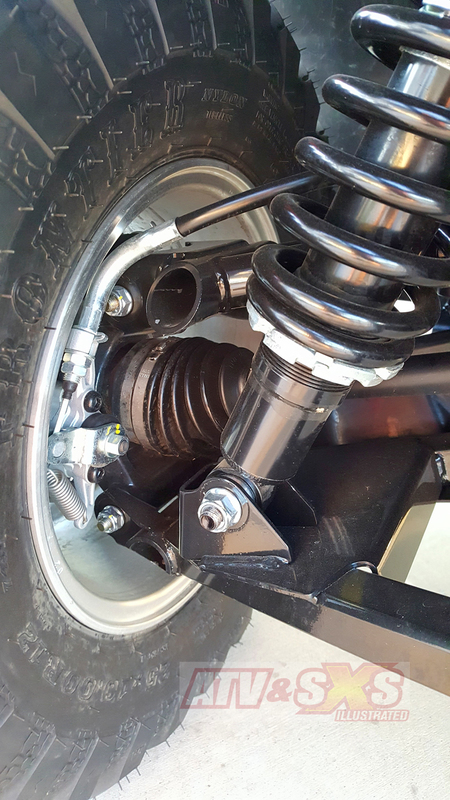 Building a strong chassis can sometimes create a rough ride but through careful use of different alloys and weld positioning Kawasaki designed the chassis to flex when needed yet still carry a heavy load. Most of the tubing is high strength, low alloy steel tubing, and the engine rides on rubber mounts to isolate vibration. The engine isn’t the only part of the chassis riding on rubber mounts. Kawasaki gave the suspension premium quality rubber pivots as well. 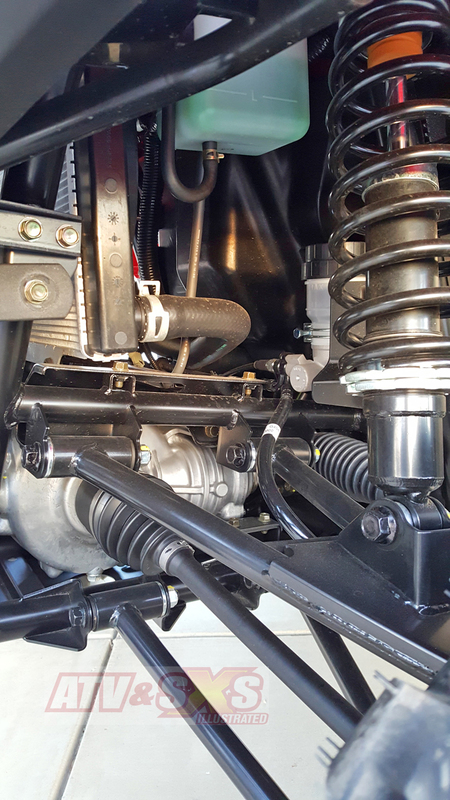 Large diameter steel tubing A-arms give the Mule Pro-MX suspension excellent strength, and a threaded spring collar on the shocks allows them to be adjusted based on the load. 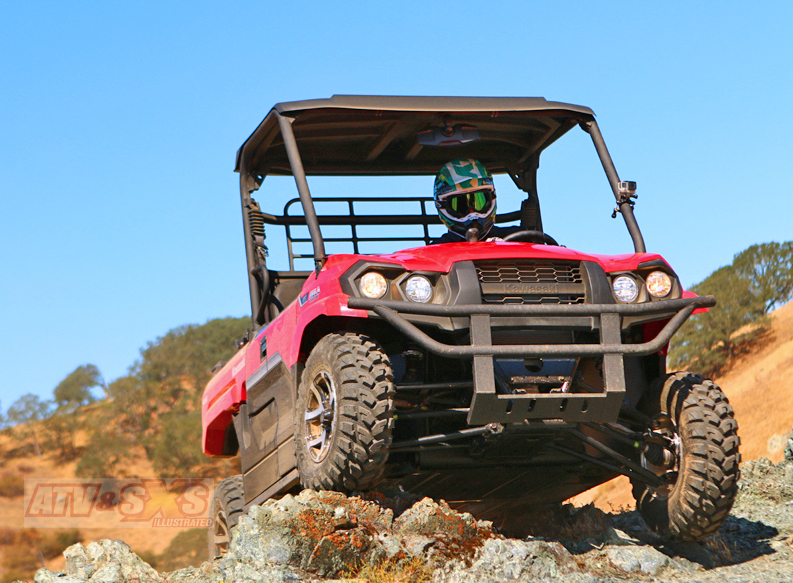 We are impressed with the chassis on the Mule Pro-MX. It’s built to last. Even the full-width front and rear bumpers are made from large diameter steel tubing. At the rear is a hitch for towing 1500 lbs, and the MX rides on 25” Duro Frontier tires mounted on 12” steel rims. The Mule Pro-MX EPS LE model gets an upgrade to cast aluminum wheels as part of the LE package. The Mule Pro-MX was designed for hard work but Kawasaki also wanted it to be equally capable of weekend recreation. The compact overall size really makes that possible and we were happy to strap ourselves into the MX and head for the trails. 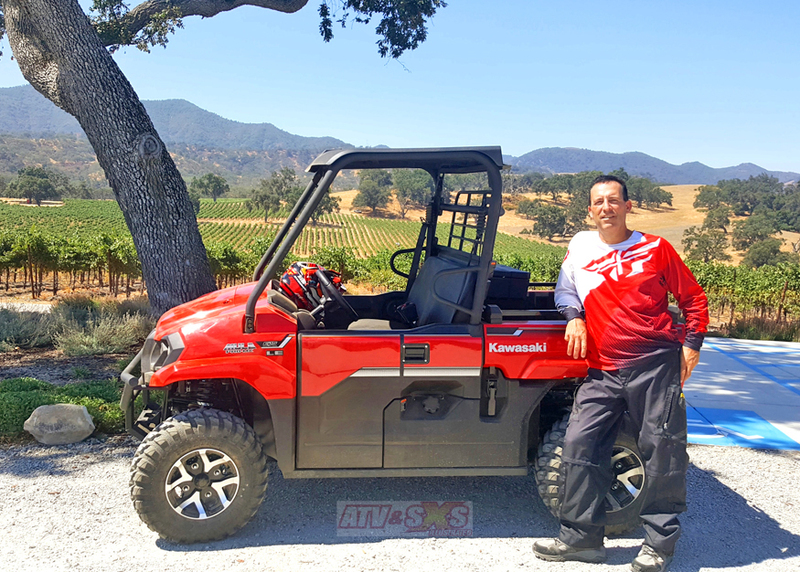 A twist of the key brought the engine to life and we easily slipped the dash mounted shift lever into High and headed for the hills of California’s central coast. The terrain ranged from twisting trails, to rocks, lots of dust, and major elevation changes. The Mule Pro-MX had no problem climbing hills. We conquered most in 2wd and High, but when 4wd and Low gear was needed the shifting was smooth with positive engagement. The Duro tires managed to find traction in most cases and we generally like this tire for its good combination of ride quality and traction. It’s a good match for the vehicle. Thanks to the considerable wheelbase and width the Mule Pro-MX never felt tippy or unstable even on off-camber trails. It can handle a serious hill from any direction. 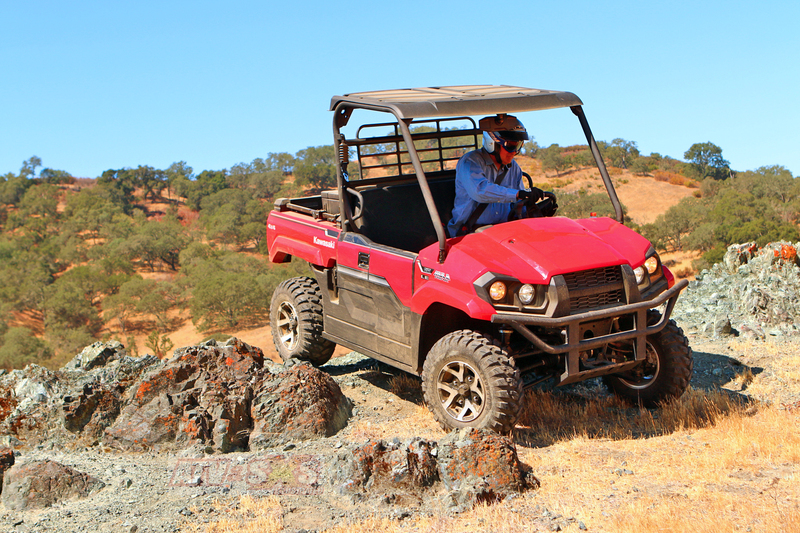 Tight turns are no problem and a tight turning radius lets the Mule-Pro MX twist its way through tight corners easily. The overall suspension action was adequate for a machine of this size, with it being neither too harsh or bottoming easily. They’re basic level shocks of limited adjustment but they handled most trail obstacles, bumps, and ruts well enough that nobody came back with a nagging back. Thankfully the Mule Pro-MX does come with considerable ground clearance which we put to use when we found a rock outcropping to climb over. The MX really showed its maneuverability in the rocks. You could creep over boulders and between ledges with precision, and only when climbing the largest ledges would we hear the full bottom skid plate contact immovable rock. That’s what the bottom protection is for! It was in the rocks we really began to appreciate three features of the Mule Pro-MX. THE EPS is OUTSTANDING! Kawasaki is still the king of power steering, and this made it extremely easy to position the Mule Pro exactly where you wanted it. SIGHTLINES OVER THE FRONT HOOD ARE EXCELLENT. We love how Kawasaki considered this when designing the front bodywork. It’s so much nicer when you can see the trail. THE ENGINE RUNS SMOOTH. There is no vibration felt in the seat, the steering wheel, or your feet with the Mule Pro-MX. It’s also quiet! Major downhill sections gave us an opportunity to try the engine braking and this works adequately with the MX. It’s not going to bring you to a stop, but it will definitely help you control the descent, especially in 4wd where the only limiting factor seems to be traction. 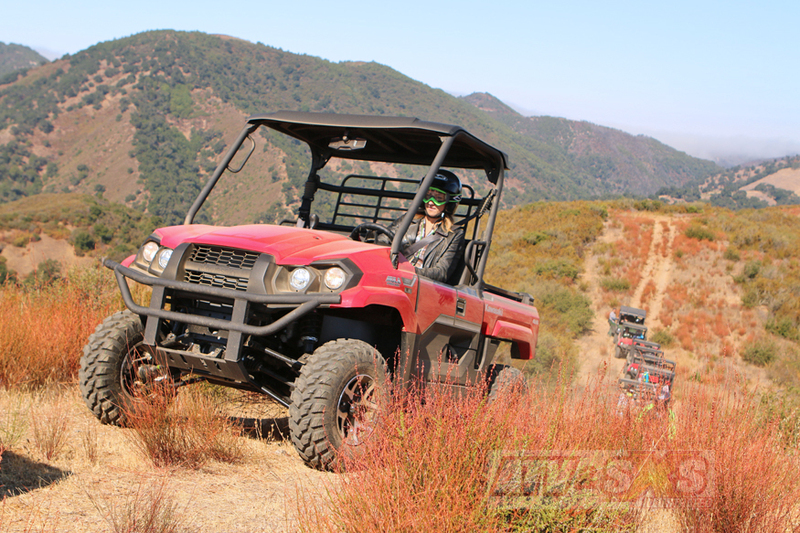 Overall, we were highly impressed with the Mule Pro-MX on the trails. It’s performance definitely lives up to the promise of it’s good looks. Kawasaki clearly used the excellent, full-sized Mule Pro-FX as their bench mark when creating the new MX. They could do no better. The Mule Pro-MX has many of the same great features, and a few we even like more! If you’re looking for all the features a full-sized machine but in a mid-sized package, you really need to take a look at the Mule Pro-MX. It’s the real deal and big chip off the ‘ol block! L x W x H 110 in x 60.0 in x 74.4 in. Also features: EPS, adjustable tilt steering, steel wheels, halogen headlamps, and two LED auxiliary headlamps complementing two halogen headlamps. Also features: EPS, adjustable tilt steering, steel wheels, halogen headlamps, and two LED auxiliary headlamps complementing two halogen headlamps, and plastic roof.